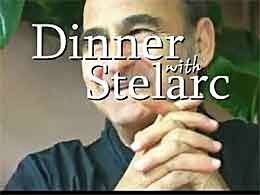 I met up with STELARC again today, and i tried out the muscel stimulation device for a second time. In the semi darkness of La Mama , the ryhthm of electrical stimulation (of the arms) bought to mind a meloncholy robot. My performance might be quite 'beautiful' , not something i had planned so far. Stelarc said that the higher the voltage, the more the movement. So basicily, this means the more pain i can handle the better the show. I got up to my pain threshold, and Stelarc said it was......performable....that is.. not great , just performable. So ill have to juice it up. I didnt quite expect my performance to be going down this... strange and painful road.